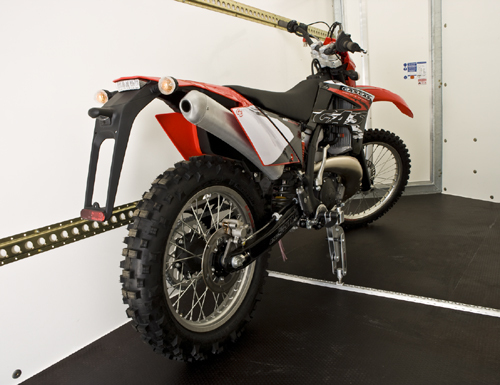 Moto Cinch is an excellent solution for transporting motorbikes either inside or on a trailer. The Moto Cinch product enables users to secure their motorbikes safely and quickly without having to use ratchet straps. It also functions as an additional shock absorber when travelling. Pressure is not exerted on the suspension as the bike is locked down on the suspension for travelling. Moto Cinch is an ideal way of transporting motorbikes to shows, events and competitions and can be used with most of our trailers by fitting two small connectors to the floor. It is particularly suited to Box Vans and P6e/P7e unbraked trailers. Fitting Moto Cinch to a trailer allows owners to better organise their motorcycles and keep them in unlocked positions for long-term storage. It also provides you with a dual purpose trailer that can be used for general transportation of goods when not transporting your motorbikes. Moto Cinch is manufactured with Aircraft Grade Aluminium with a brushed finish. It is light-weight and yet very strong. Moto Cinch fits most make and models of off-road motorcycles. 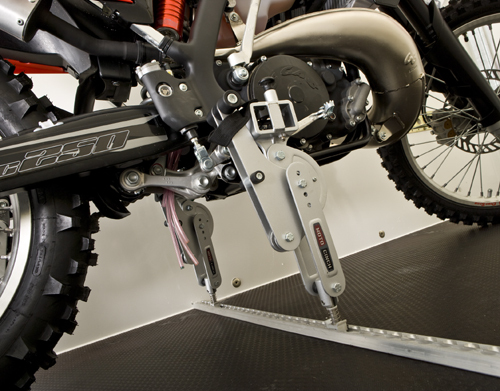 The bolt-through anchors and body of the Moto Cinch keep your motorcycles secure in the toughest and most extreme terrains while reducing the load normally placed on front suspension springs and seals. Dimensions & weights are given as a guide only. Ifor Williams Trailers and Whitehall Trailers have a policy of continuous development. We reserve the right, therefore, to alter specifications without notice.